Little critters are out and about again, after hiding away for the winter. Now that we’ve had a few days of warmer weather — just a tease, really — I’m starting to see the frozen tundra of a landscape come alive. 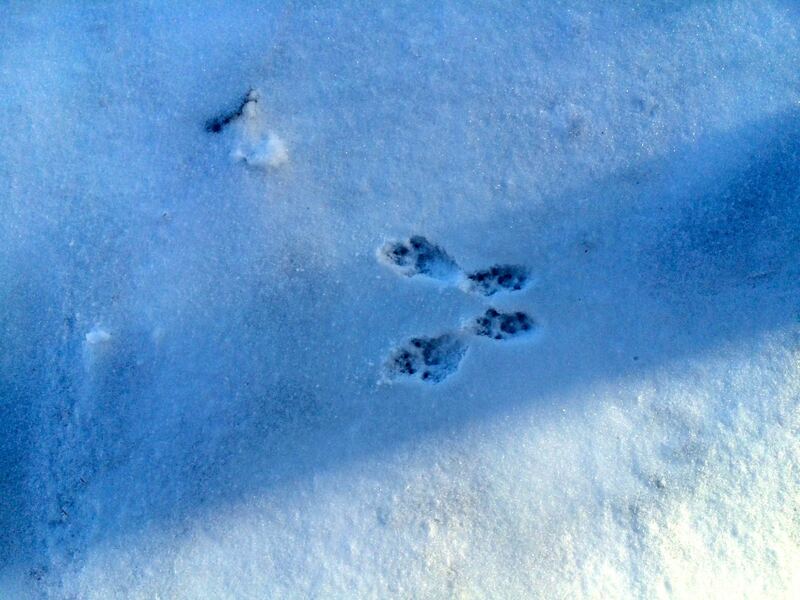 We had a dusting of snow the other day and the next morning, there were rabbit tracks all over. It made me realize that for a long time, I saw no tracks. Even the deer have re-emerged after being nearly invisible all winter long. This morning their were eight deer in my backyard, including one right outside my living room window, munching merrily away on a bush. I still haven’t been able to ride. Although much of the snow has melted, there’s still almost a foot on the ground in many places and it’s so compacted and hard, the horses want no part of going through it. Plus the repeated cycles of melting and freezing have sheets of ice on all of the areas that were cleared. Hunting is supposed to start on April 14th but the idea of being able to go out and ride through fields seems like it’s more than a month away. I sure hope I’m wrong. even tho it’s currently snowing here in baltimore as i write this – i can’t help but think you’re right. spring is coming!! Oh I DO hope you’ll be able to get on soon! I really loved seeing your hunting pictures last season.